Is your cover getting old and heavy? Hot tub covers last about 3-5 years, depending on care. When it’s time to start thinking about getting a new one, call us! We sell Watkins Wellness manufactured spa replacement covers, which means for your Hot Springs spa, the cover will fit right without any guesswork on measurements. 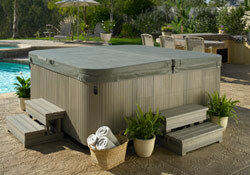 For spas that aren’t Hot Springs, Tiger Rivers or Hot Spots, we offer non-Hot Spring replacement covers. Please call 410-252-5116 to order your new cover today! For non-Hot Spring covers please fill out this form and we will send you a quote. Every hot tub should have a cover lifter. 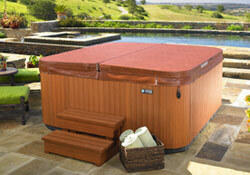 Learn more about Hot Spring cover lifters here. 4.0 mil vapor barrier locks in the entire core sealing out moisture. 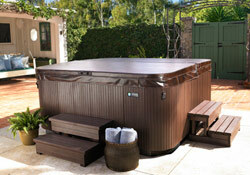 Industrial grade Double-ply poly laminate is formulated to protect cores against daily exposures to chemicals and cold. Mildew and UV resistant. 2lb cell foam tapers from 3 1/2″ 2 1/2″ to maximize rain/snow runoff. 25 oz top vinyl is Marine Grade and exceeds industry standards for mildew, UV and chlorine resistance. Low profile nylon drain grommets aid in the release of trapped water. Stainless steel reinforcements strengthen the center of the cover. Every cover comes with brackets built to factory specifications to assure strong support and easy installation for retractable cover systems. Tough ‘n Hefty hinge is made with four layers of double-stitched vinyl to add extra strength and durability. Child-resistant cover locks with keys. Commercial grade zipper and protective flap. *Additional Colors available. Please call or stop in to order a cover.